There’s nothing quite as daunting as a blank page. Gasp! That void could be filled with anything. Or everything. Or nothing. The emptiness stymies. It taunts. It goads. 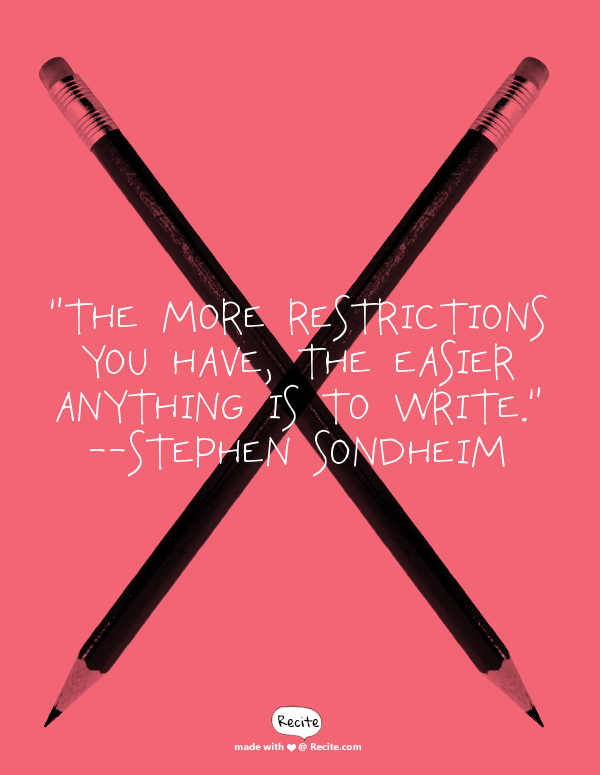 According to Stephen Sondheim, restrictions can unleash creativity. It seems counter-intuitive. Absolute freedom seems as if it should loosen us up, but what gets us going are boundaries to bounce against. Play word games (five-word sentences; narrative through dialogue only; no adjectives; no words beginning with A; create palindromes; play with a literary device). All of these restrictions make it easier to get started and keep going. Restrictions give you a point. What’s your favourite creativity-sparking restriction? Please share in the content. I love mathematical limitations. Patterns, like going 5, 4, 3, 2, 1 words or 1, 2,3, 4, 5 in a poem or like the ones in a nonet. I love repetition patterns at in villanelles. Let Ali know what limitations you like to put on your writing. She’s exploring the freedom of setting limits.